The table, not including the top, is 36 inches high, 18 inches deep, and 24 inches wide. I will leave myself 4 inches of over hang on each side, and 3 inches of overhang on the front and rear of the table. I still do not have a table saw or a mitre saw, so this will make things a bit more complicated. Click on image for full size. Here are some links to other router tables that have followed my design, or used it for inspiration. First Router Table by Jeff. I decided to make the table out of poplar. It is a soft but strong wood, and about an average weight. I bought 4 2x2s and cut them to 36". I also bought a couple of 1x3s and 1x2s for the table frame. The pocket hole jig from Kreg is a great tool for this project. It cuts perfect pockets for your screws. I recommend the pocket hole screws from Kreg as well. These are the front and back pieces of the router table. The front pieces are flush with the legs because I'll have cabinet doors on the front. The back are recessed 3/4" and I'll be adding a poplar ply to them. The basic frame of the table. The longer pieces of poplar on the front and back are 21 inches, for a total of 24inches wide including the legs. The sides are 15 inches, and 18 inches total. The bottom pieces are 3 inches off the ground. Using a pocket hole jig to attach the lower rails of the cabinet. The frame of the table with the lower rails attached and a piece of old pressboard that I had cut to fit as the lower cabinet floor. I began framing in the router box by measuring the opening in the top of the router table, and figuring out how big I needed to make the box. I used the rest of the pressboard to make the sides, bottom, and back of the router box. Everything framed here with tons of pocket holes. The drawer openings aren't as big as I would have liked, but they will be sufficient. Box screwed into the frame and router table top in place. I purchased 4 undermount drawer slides from Rockler and mounted them into place. I will be making the drawers last. Drawer slides, and router box completed. Everything on the inside is done here. Next I will be attaching the top and the sides. I used half inch birch plywood for the sides. Here it is with the sides and top fully assembled. All that's left is the drawers and the cabinet doors. I made the drawers with 1/4" poplar. I used a 1/4" router bit for the dados for the bottom and the back. The drawer fronts were also made from poplar. I got a little 3/8" beading bit from Rockler for the edges. Gluing the fronts to the drawers. The knobs were little beech knobs that I also bought from Rockler. 3 of the drawers will be standard drawers. The one on the upper right side is a piece of 3/4" poplar with 1/2" and 1/4" holes drilled to store router bits. Here it is with all of hte drawers and fronts assembled. And again with the drawers open showing the router bit storage. This is all I can do for now until I get a cabinet door bit set. 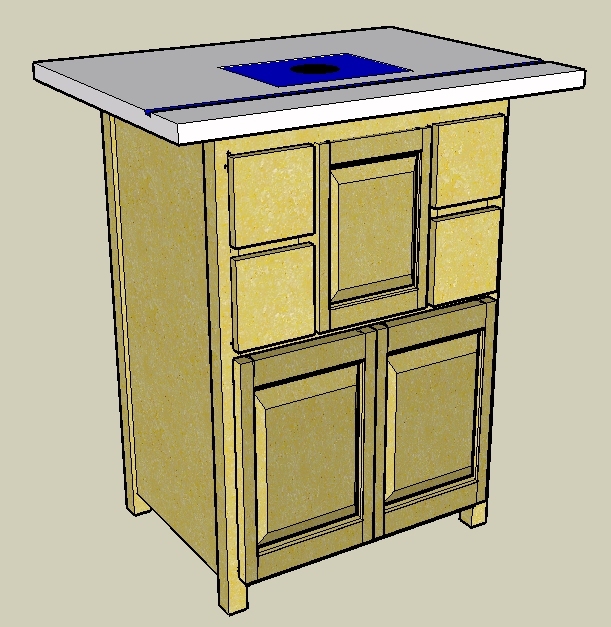 Here is the mock up of the cabinet doors. I used 1x3 poplar for the lower cabinet doors, and 1x2 poplar for the upper door. When the bit set comes in shorly, I'll be able to finish this project finally. As you can see, I've already stained the rest of the table. Freud 97-102 3-Piece Cabinet Bit Set with 99-518 and 99-260 Rail and Style Bits $50 on ebay, never used, box slightly worn. I can't believe I got such a good deal on these. I mismeasured the mock up. Once you route the rails and stiles, you lose 3/8" on each side of the stile, so you have to add 3/4" on each rail for them to be the correct length. Raised panels are hard to do. I made about 4 passes on each raised panel taking off a little more wood each time. These aren't the best doors, but it was my first attempt, so I'm happy with it. It's extremely difficult (for me) to route the sides of the rails. I put together this little jig to help me guide the wood through. These are my completed doors. They are far from perfect, and I'm not really that pleased with them, but I really really don't want to make them again. They are not sanded or glued yet. I cut some plexiglass for the top cabinet, and fit it like a flat panel door. The other two raised panel doors for the bottom, were not perfect, they are my first ones, but they are ok. I mixed some sawdust and a little wood glue to fill in the couple of gaps I had, and sanded it down. I will be able to make better doors in the future, but I really don't want to do these again. My buddy says nothing you make looks as good to yourself, as it does to other people, Since you can always find flaws in stuff you make yourself. I just need some hinges and I'll be finished. Drawer with router bit storage. Thanks for looking, now on to the next project.